Getting there: From the park entrance, drive down Park Road 5 into the canyon. Drive past the amphitheater and trading post. After the second low water crossing, look for parking at the trailhead on the right. A view from the trail. Note the solitary hoodoo on top of the mesa on the left. 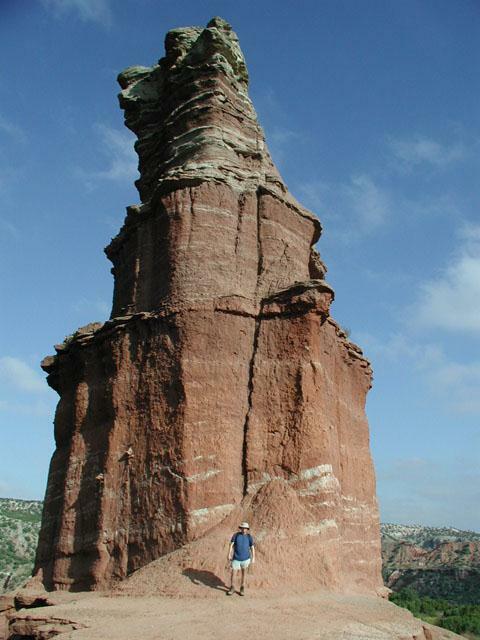 The Hike: The Lighthouse is the geological signature of Palo Duro Canyon State Park. The stone pillar graces many of the souvenirs sold in the area. A brick rendition of the Lighthouse sits in front of a local school. So it should come as no surprise that the Lighthouse Trail that leads to this formation is the most popular hike within the park. But we lucked out. Trail signs differ on how much water one should take on this hike. One says take a quart per person and another at the same trailhead says take a gallon per person. Despite the disagreement, both signs bring up a good point. Always hit the trail prepared and one of the top preparations here is to have enough water for the round trip. Coppertone looks towards our destination, the Lighthouse. The hike starts at the waypoint "Trailhead" on the topo map. At the trailhead there are two paths leading from the parking area. Both will join up just a short distance away, so take either one. 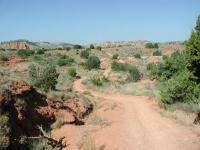 The trail heads west toward Capital Peak. The trail surface, like much of Palo Duro, consists of packed dirt and rock. There are sandy patches as well. There is some confusion about the trails that join up with the Lighthouse Trail before it gets to the base of Capital Peak. To the south, the official park map shows them to be part of the Capital Peak Mountain Bike Trail. Trail markings on the site hint that hiking is allowed, though the name and icons shown on the park map hint otherwise. Regardless, we didn't have time today to investigate them further. Much of the trail leading to the lighthouse is over rolling terrain. The trail starts off relatively flat until it reaches the bottom of Capital Peak. 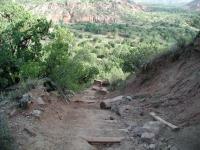 At this point the path wraps around the peak and eventually parallels Sunday Creek north of Capital Mesa. There are numerous creek crossings, but on our trip all of the stream beds were dry with the exception of one. That one was more of a puddle than a flowing stream and thus presented no barrier at all. Up until the final approach to the Lighthouse the trail undulates over small ridges and into and out of the creek bed. Soon after wrapping around Capital Peak the trail will run into the Cottonwood Flats Trail that is part of the Givens, Spicer & Lowry Running Trail. Keep to the left to continue towards the Lighthouse. The trail leading to the first "step" towards the base of the Lighthouse is steep and somewhat eroded. Here's what it looks like from above. The often sandy soil leaves lots of evidence of animals that have passed this way recently. The most common tracks were actually beetles, which were quite abundant during our hike. Deer, rabbit and Coyote tracks could also be seen. We almost snuck up on two young bucks who failed to take notice of us until quite late due to the direction of the wind. Hopefully they'll learn to be more alert as they get older. Though not seen, we heard turkeys along the trail. Coppertone and the Lighthouse. Get to the top of the first step and this is the view you'll see. Don't let the topo map fool you. The map appears to show the trail crossing the park boundary and into private property. However, the topo map is based on old data and the Lighthouse is definitely within the park boundary. 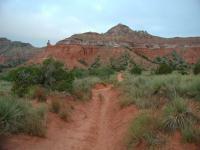 As a matter of fact, Palo Duro was also expanded yet again in April of 2005, this time by 7,873 acres on its eastern end. We should see more trails in that area of the park in the future. The ascent to the Lighthouse can be divided into two "steps", not to be confused with the large number of steps required to tackle each. The first step begins immediately after a park bench in a nice shady area practically in the shadow of the pillar. The first step is a pure stairmaster workout. Though wooden logs reinforced with drilled rebar were put in place to provide for an easier climb, considerable erosion has washed away the claystone around it leaving large gaps around the logs. Austin Explorer poses at the base of the Lighthouse. 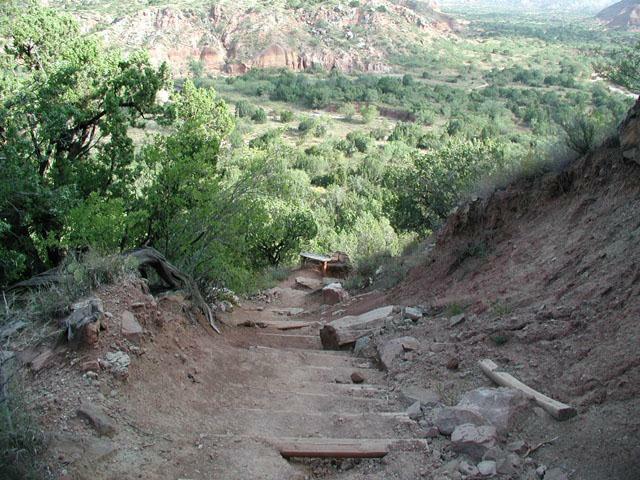 The trail flattens out at the top of the first step. Here a bench marks a near ideal site from which to take a picture of the Lighthouse. But we're not there yet and we wanted to get to the Lighthouse, not just near it. So we continued south and approached the second step. This step is not nearly as long as the first. However, the second step has not been maintained or modified in any way. The short step is steep, with loose rock and crumbling claystone. It was dry when we visited, but I can imagine that the claystone would get slippery when wet, so be careful. The Lighthouse is joined to the rest of Capital Mesa by a flat ridge and it's on this ridge that the second step ends up. Here you can walk around part of the base of the Lighthouse. But the flat causeway also provides spectacular views both of the valley through which we just hiked, but also the continuation of the Sunday Creek valley to the southwest, a view few in the park ever see. Coppertone poses on an overlook along the first step climb to the Lighthouse. Behind here is the valley we just hiked to get to this point. On the trip out to the Lighthouse we saw only one other person, who overtook us as we neared the turnaround point. On the way back we encountered more and more people who rejected the opportunity for an earlier start and more solitude. Their loss, our gain. All of the people we saw were hiking or walking. No runners. No bicyclists. No horseback riders. The most amusing "hikers" we encountered on the trail were within a hundred yards of the trailhead on our way back. An older man and women were asking some other people how far they needed to go to see the Lighthouse. They were obviously not dressed for the trek and she was even sporting a cigarette and they had left one of their companions in the car, but they had their camera and were willing to go the extra mile for a great photo. Sort of. When we chimed in and stated that they might catch a glimpse of the Lighthouse a mile down the trail, but to get close it would be more like three miles their adventurous zeal was dashed and they returned to the car. At least they didn't need to be rescued. 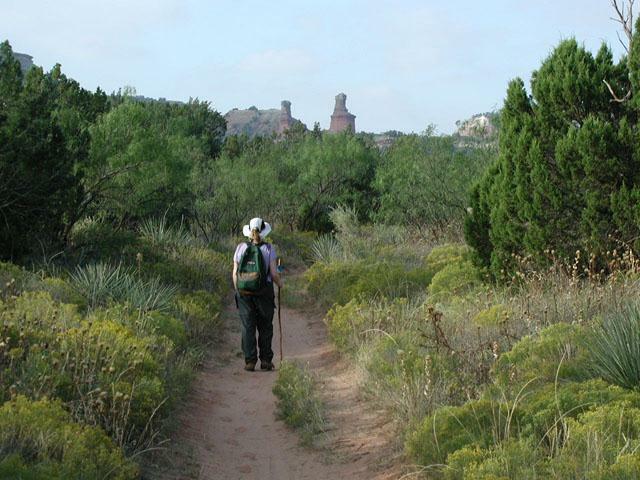 This hike is obviously not the place to find solitude in the park, but it is THE destination hike in Palo Duro. It is well worth the trip and if you leave early enough you can possibly have the Lighthouse all to yourself. The day I made this hike I had the entire trail to myself. It was raining which made for a nice cool day but made it pretty tough to hike with the red clay of the trail being so slick. I enjoyed the hike very much and plan on going back again when I can spend some more time there. A Must See in Texas!! Did this with a scout troop on a very cold weekend. 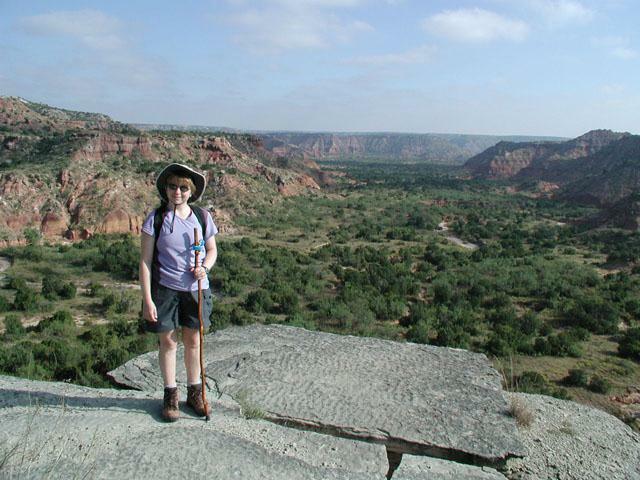 The hike is one of the most scenic in Texas. The hike is pretty easy EXCEPT for that last climb to get to the bLighthouse trail. That is a VERY steep climb on very loose dirt. Not for hikers carrying more than 20 lbs. If you have backcountry packs you want to drop them and make the climb. Day packs are fine for the climb. Make time to spend some time at the top though. The view is AWESOME!!!! Good hike in Palo Duro. I've done this trail twice now, once back in April via the GSL trail, and this time. 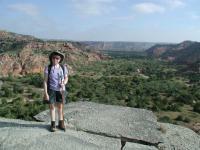 I love the views of the canyons and the different layers of rock you see as you hike. Be wary of the temperature though, at 9:15 pm it was 80º but 3 hours later it was 104º when we made it back to the trailhead, so bring plenty of water. It was cloudy and the temperature was in the 40s the day we hiked. Took my wife and my daughters ages 10 and 12. We encountered several other hikers and several small groups on bikes. Even in the winter one should carry water. The hike from the picknic table (A little over 2 miles down the trail) to the lighthouse is quite steep. Treaking poles were of a great help. Beautiful area. We started at 8:30 at the Chinaberry Day Usea Area. There were several trail options. We chose to do the Lighthouse Trail and then we came back in on the Cottonwood Flats - Givens, Spicer, Lowery Trail. We did approximately 17K. This review is for the Lighthouse Trail, not the Givens, Spicer & Lowry Running trail. 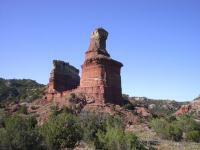 Palo Duro Canyon State Park is a very beautiful park and the Lighthouse Trail, in my opinion, is the trail you will want to take if you don't have a lot of time and just want to get to see Lighthouse Peak, Castle Peak and Capitol Peak. The trail is fairly flat the entire distance out and back, although you have some light climbing at the end of the trail near Lighthouse Peak. What made this particular hike difficult was the extremely warm weather. It was over 100 degrees in late September and so warm that I decided not to stay overnight and camp. Although there are interesting sites along the way, the big attraction is Lighthouse Peak. You have to ascend some hapzard steps to get there and the ascent is quite steep. Once you get to the top, however, it is flat again and quite beautiful. The trail runs out at the peak, although you can go adventuring beyond the peak if you want to brave it. There are a few inviting canyons in the vicinity. Aside from hiking, I recommend seeing the park by car as the park has many beautiful sections that can be seen from the road. Be aware that there are a lot of snakes in this park. I saw several crossing the paved road and another hiker told me she saw two snakes hiding in the shade beneath the steps. They weren't aggressive, but you need to take caution regardless as medical help is not nearby in the event you are bitten. One last advisory -- this park has several low areas that are prone to flash flooding. In fact, there are 6 river crossings on Park Road with water height markers. As a result, do not go hiking in inclement weather as dangerous conditions could arise. Quite busy for a winter weekend. 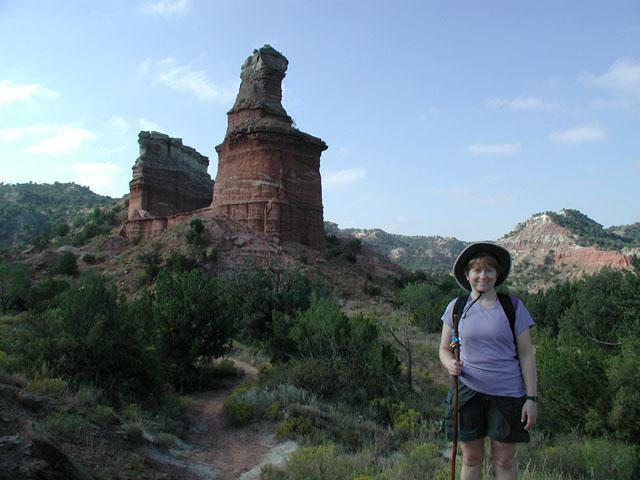 This popular trail at the popular Palo Duro Canyon is not one for solitude but the trail itself is beautiful and can be difficult in spots too. 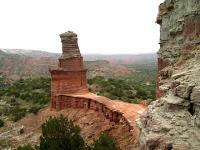 We hiked passed the lighthouse formation into the back canyon for almost a mile before we turned around. There were some interesting "stonehenge" formations that we passed on the way.